Locals visit a monument with the names of the victims. It has been 23 years since the PKK terrorist organization left an indelible mark on a small village in an eastern city by carrying out one of the bloodiest mass killings in its history. 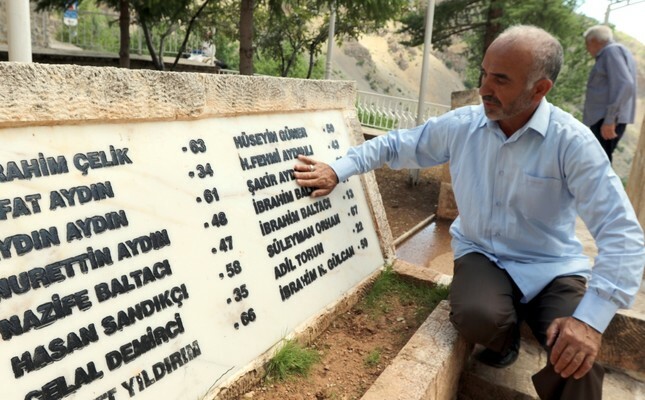 Başbağlar, a village 220 kilometers from the city of Erzincan, is remembering the July 5 massacre where 33 locals were gunned down, with sorrow and anger as justice continues to elude the masterminds of the massacre. Dozens of PKK militants stormed the village in 1993 and went on killing civilians one by one. Over 200 houses, a clinic, a school and a mosque in the village were burned down by terrorists, where no previous terror attack had taken place. Ali Akarpınar, the village headman who survived the massacre with serious wounds, is forever haunted by the tragedy. Speaking to Anadolu Agency, Akarpınar recounted how it started. "They came to the mosque after we performed evening prayers. They ordered us to gather for 'a meeting'. After they rounded up people, they told us about how glorious the PKK was and spoke about the Sivas massacre. 'We will avenge those killed in Sivas' they told us," Akarpınar remembers. He was referring to an incident in the central Turkish city of Sivas, just three days before the killings in Başbağlar. A group of rioters stormed a hotel in Sivas where artists and intellectuals, mostly those of the Alevi faith, were staying. The hotel was set alight and 35 people including prominent poets and intellectuals were killed. Though the PKK does not claim any affiliation with any faith, the Başbağlar massacre was viewed as the terrorist organization's retaliation of the Alevi deaths. As Akarpınar and others were rounded up, the militants started setting houses on fire after looting. "Some 30 minutes after the militants rounded us up, I heard a couple of gunshots. Then, they opened fire on us," he says. Twenty-seven people were shot dead among the villagers gathered by the PKK and one other was killed in his house. Five others, including one boy, were burned alive when the militants set their houses on fire. "It was a genocide within just two hours. They even killed sheep and cows," Akarpınar says. Hatice Özdemir lost her husband Ali in the massacre. Her son, who was just an infant when the massacre took place, is now a 23-year-old man. She is angry that no one was sentenced to life for the killings. "We never heard of anyone that was imprisoned for this crime. If only they could punish someone, it would be a bit relief for us," she says. Nearly 20 people were arrested as part of the investigation; 18 were later released. Only two people were jailed and sentenced to life imprisonment - for being members of the PKK. Although the PKK apparently claimed responsibility for the attack, during interrogations, jailed PKK leader Abdullah Öcalan said that he had been unaware of the incident. The case was closed in 1998. Speaking to media outlets in 2013, a judge who handled the case regarding the massacre said police arrested the wrong people and the incident was not properly investigated. Şakir Kadıoğlu told Yeni Şafak daily three years ago that the indictment on the case was based on the testimony of a low-ranking military officer stationed in Erzincan and defendants were mostly Alevi villagers from the nearby city of Tunceli. Kadıoğlu said they could not even find evidence linking the alleged culprits to the massacre and he was obliged to release the defendants.